Mississippi Delta proved a punctual choice in her stakes debut in Saturday’s $128,750 Glorious Song for 2-year-old fillies, giving trainer Mark Casse his third straight Woodbine stakes win. 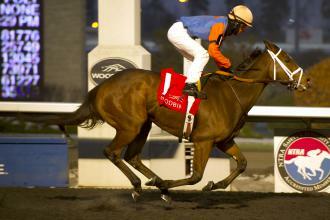 Mississippi Delta won her stakes debut Saturday in the Glorious Song Stakes at Woodbine. After breaking from the rail, Mississippi Delta ($4.10) raced outside in fourth before angling to the rail on the turn in the seven-furlong sprint. She went back outside for the drive and rallied to prevail by two lengths over the 8-1 outsider Roaming in a quick time of 1:22.17. Pankhurst set moderate fractions before fading to third, while Indiantown Sunrise wound up fourth after a miscue at the start. Patrick Husbands rode Mississippi Delta, who banked $75,000 for owners Mike Rutherford and Jackpot Ranch.